How was Emily Dickinson able to be frugal and fruitful in her art? “There is no Frigate like a Book / To take us Lands away,” wrote Emily Dickinson, who had thousands of books at her fingertips in the Dickinson family library yet never published a book in her lifetime. Her ascension to literature’s frigate class came posthumously, after her sister Lavinia discovered her handwritten, hand-sewn fascicles in a drawer, along with scraps of verse composed on envelopes and recipe cards. These were sifted and corrected, reconstituted and standardized by a variety of editors, including Susan Dickinson, the wife of her brother, Austin, and Mabel Loomis Todd, his mistress, who aspired, with Thomas Wentworth Higginson, to give Victorians a readable Emily Dickinson in Poems (1890). Sixty-five years later, Thomas H. Johnson published The Poems of Emily Dickinson, the edition by which most of us know her work. Johnson restored her idiosyncratic capitalization and punctuation, chiefly those dashes that syncopate her common (hymn) meter. This was considered a restoration of the “real” Dickinson, whose poems became readable only after modernist experiments like fragmentary collage upended Victorian print conventions. Edited by Marta Werner and Jen Bervin. Conventions about reading Dickinson’s poems were also upended when, in 1981, Ralph Franklin published a facsimile edition of the poet’s manuscripts that lifted the veil from Johnson’s own interventions, chief among them the selection of words that Dickinson had not herself chosen from the variants she had written in the margins (marked by little plus signs) or underneath the word in question. This disjuncture galvanized the poet and visual artist Susan Howe to write My Emily Dickinson (1985), which, besides making a case for Dickinson as a great antinomian thinker, placed her alongside Gertrude Stein as a radical innovator who introduced indeterminacy to American poetry. In 1998, Franklin took his editorial work a step further when he published The Poems of Emily Dickinson: Variorum Edition, which for some poets has eclipsed the Johnson edition. Now the electronic age has a Dickinson of its own: edickinson.org. That’s the URL of the Emily Dickinson Archive, launched October 23 of last year, which features high-resolution images of the manuscripts included not only in Franklin’s Variorum Edition but also the collections of various libraries along the Eastern Seaboard: the American Antiquarian Society, Amherst College, Yale’s Beinecke Library, the Boston Public Library, Harvard’s Houghton Library, the Library of Congress, Smith College Libraries and the Vassar Special Collections. All of these institutions worked together to consolidate the scattered corpus, at least virtually, and make it available to the public under a Creative Commons license. Are we now closer to the real Emily Dickinson? Not by a long shot, says the chief archivist at Amherst College, which owns 850 of her manuscripts, of which a little over half (539) are in the online archive. Another omission: only the manuscripts of her poems, not her letters, made the initial cut. But who decides what a poem is? Dickinson’s letters, like Keats’s, are universally acknowledged as masterpieces in their own right. Some of the letters are poems, and from others she culled many verses. Dickinson’s letters blur the boundaries between genres: she employed as much circumlocution, compression, metaphor and sound work in her correspondence as she did in her poetry. Yet even if all, or most, of Dickinson’s manuscripts end up online, would we be any closer to the real thing? In a material sense, undoubtedly so: with the tools we already use to zoom in on maps (to find the location of a new restaurant) or shopping websites (to see the detail on a jacket), we can get as close as we want to examine how Dickinson formed her c’s or how little paper she required to write a quatrain in her own hand. Depending on your tolerance for clicking and tapping, you could spend hours on the archive site browsing manuscripts according to first lines, or tracking the usage of a single word back to Dickinson’s own edition of Webster’s Dictionary, if you so desire. Draft F322A, “Good night! Which put the candle out?”, envisions an army drummer woken to a “purer Reveille”; it might be useful to know that the only definition of “reveille” provided by her dictionary is “resurrection.” By registering on the site, you can access a tool that allows you to make notes and bookmarks. You can make a transcription appear or disappear alongside the original. You can determine the provenance of a scrap, its estimated date of composition according to which editor (Dickinson did not date her works) and, for most, whether it was written in pen or pencil (she transitioned from pen to pencil over the decades, contrary to expectation). I can’t quite get past the irony of an Internet archive treating us to the unmediated Dickinson: it’s more hologram than holograph. At the very moment that we are reaching for Dickinson at her most material, we are given pixels. As an educational tool—and a promotional vehicle for Dickinson and her books—the Emily Dickinson Archive will surely be invaluable. But the minimal editorial framing of the poems—the better to let you do the framing—can make the drafts seem a bit orphaned in the vast simulacrum. It’s as if Dickinson had never chosen to gather her poems into fascicles. With very little editorial guidance through this digital disaggregation, it can seem as though the naked availability of the images hides something else—or, perhaps worse, nothing—behind them. In short, the archive is a place to visit, but not to dwell. A different approach to Dickinson’s variorum is on offer in The Gorgeous Nothings, edited by Marta Werner and Jen Bervin. Werner is a Dickinson scholar at D’Youville College; Bervin calls herself an “erasure poet” whose expertise is in blurring the lines between poetry and visual art. Their coffee-table book is an immaculate object of white, ivory and sepia. 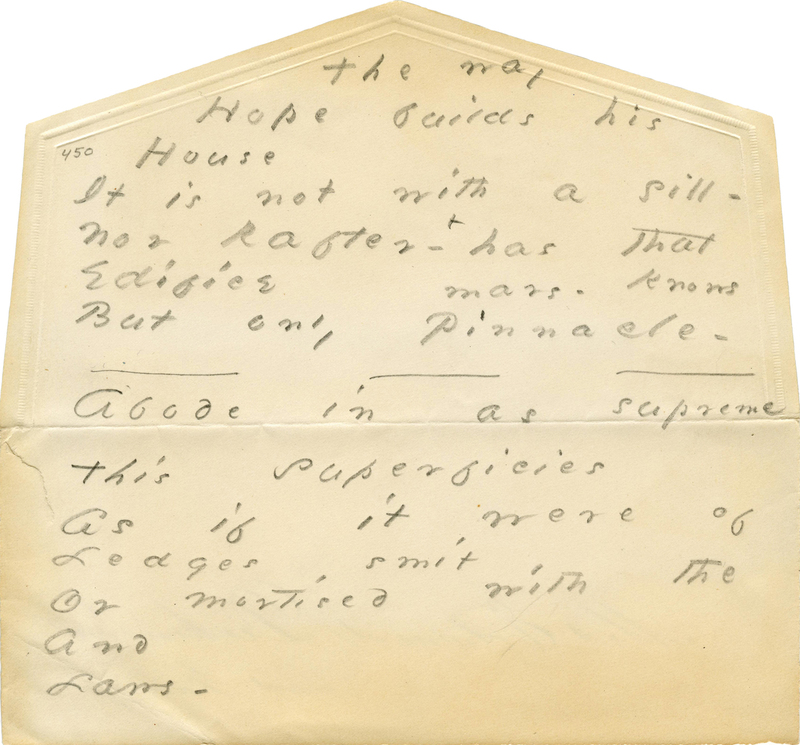 It reproduces fifty-two “envelope writings,” previously known as “scraps” in Dickinson scholarship. Rather than hastily dashed off in the heat of inspiration, they were carefully composed with regard to the visual field, as Bervin argues: Dickinson angled “the page to write in concert with the light rule and laid lines in the paper, using internal surface divisions, such as overlapping planes of paper, to compose in a number of directional fields.” The envelopes were precisely cut into shapes beforehand. Bervin explains that at the Amherst College Library, “Margaret Dakin has acquired what is believed to be Emily Dickinson’s lap desk; its painted wooden surface is positively riddled with myriad fine cuts.” Visual artists, too, now have their own Emily Dickinson. The word “freight” appears throughout these fragments, a reminder that a posted letter only seems lightweight: words are as valuable as any cargo. Or at least Dickinson’s were. In her marvelous essay, Werner quotes correspondence between Helen Hunt Jackson and Dickinson. Jackson, suffering from a broken leg, wrote warmly and chattily to her friend, ending with: “I hope you are well—and at work—I wish I knew by now what your portfolios, by this time, hold.” Dickinson wrote three drafts of her response, punning on the injury not to a leg, but to a poetic foot: “Dear friend—To reproach my own foot in behalf of your’s, is involuntary…. Knew I how to pray, to intercede for your Foot were intuitive, but I am but a Pagan.” Sadly, before Dickinson could post her reply to California, the newspapers announced Jackson’s death. It just missed the dead letter office. I love Dickinson on the page, but despite the novelty of the visual and indeterminate Dickinson, we shouldn’t lose track of the sound of her words, when the poems are reassembled and recited in the common meter. Many poems benefit from simultaneous seeing and sounding, like A128: “All men for Honor / hardest work / But are not known / to earn — / Paid after they have / ceased to work / in Infamy or Urn —”, where the homophonous rhyme is ironized by the visual difference of the words. Is it possible that, given contemporary art’s obsession with process over product, which dovetails with our scientific fascination with the “creative process,” the meaning of Dickinson’s indeterminacy has become overdetermined? Frigate and frugal must have suggested each other to her acute ear. This is the paradox of materiality: sounds are something, material and ephemeral, both nowhere and no thing. Gorgeous nothings. And so we come full circle on the materiality of Dickinson: from curatable fragments, reproduced as photographs and pixels, to the disembodied words uttered in sound waves or even carried in the head, as the body might carry the soul. Bervin tells us that Lydia Maria Child’s The Frugal Housewife (1830) was part of the Dickinson family library. In Latin, frugal is related to “fruits.” How Dickinson could be both so frugal and so fruitful is one of the mysteries not only of The Gorgeous Nothings, but of all of her art.